First of all, I would like to thank you all for viewing this blog. It isn't much but 1000 views have now been achieved. Thank you! 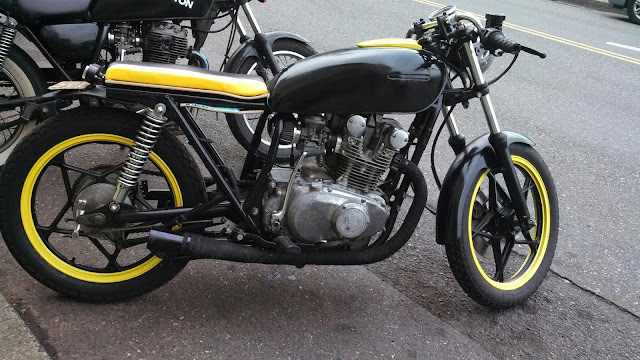 It is nearing the end of February and I would say about 90% is done on this Suzuki. A few weeks ago there was The One Show put on here in Portland Oregon. 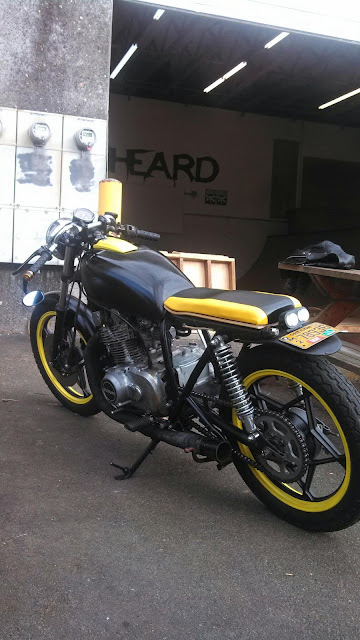 It was a great event and got a ton of inspiration to get this bike finished in the coming month. The event was almost 2 weeks ago. 2 nights before the event I was messing around with the bike and figure out why I wasn't getting spark, a very simple reason and I feel a bit dumber now that I learned what I did wrong. With every first build there is mistakes, with every first rewire on a bike there is going to be mistakes maybe like not hooking up a few wires correctly. Well it pays to play that game with the motorcycle. I fortunately got some wires corrected and it fired right up when I filled the gas tank up, it unfortunately blew all of my lights when I did that so I had to purchase a new headlight and tail light for the bike. But more importantly the bike runs. I decided the morning of the one show to go take it for a spin to maybe meet up with the local rokcers group for some coffee and break fast. Luckily enough I had my buddy john with me on his bike to be my backup in case something went wrong, and it did. I did cut out another skateboard up and use it as my wiring retainer under the seat. After trying to take it for a spin to the coffee shop, it started spitting and sputtering and just overall not firing correctly. Felt behind both exhausts and sure enough one was very strong flow the other not so much. I spat and sputtered all the way home with no headlight or tail light, but lucky enough John was rolling behind me and we got it there safe. One home, I took off my points cover and sure enough one of the points actually came in screwed and fell off. All the parts retained in the casing so I just had to put it all back together and gap the points correctly. 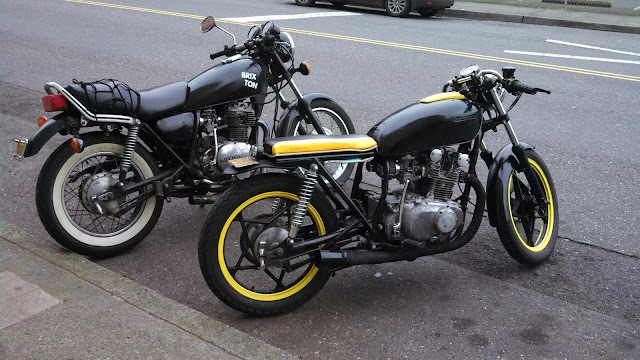 After fiddling with the points I was able to get it running very strong on both cylinders. I have been going back in and checking the points to make sure they are staying together. I messed around with the wiring some more to figure out what the heck is going on with the lights blowing and I still haven't figured out the issue in my wiring but do know the output to the lights is way to high and might have a bad regulator. I am going to switch a few suspect wires around and see if that lower the output to the lights and blow some dummy lights, rather than my brand new headlight and tail light. One other issue I ran into is my clearance for the back wheel is just to close to my skateboard fender so I need to either raise the board up, or raise my springs a notch so I have no issues with that. It is just rubbing at every possible bump. I have an idea if I need to raise the board up, if in fact raising the rear springs doesn't work. Won't know until I try and luckily it isn't detrimental to how the bike runs but how it rides. One last fix was my petcock, it is no longer leaking so the stain I have on my engine case will stay clean once I clean it one last time. 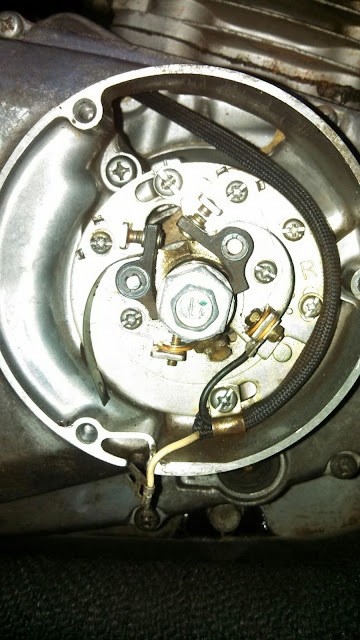 In did realize in forgot to change out my shifter seal, so it is leaking a tiny bit and that seal is on order to be replaced. Make sure this thing is running up to par before taking it farther than a few blocks for fear of breaking down. Next post will be full of fun stuff, stay tuned for the photo shoot I was able to do with the moto lady.